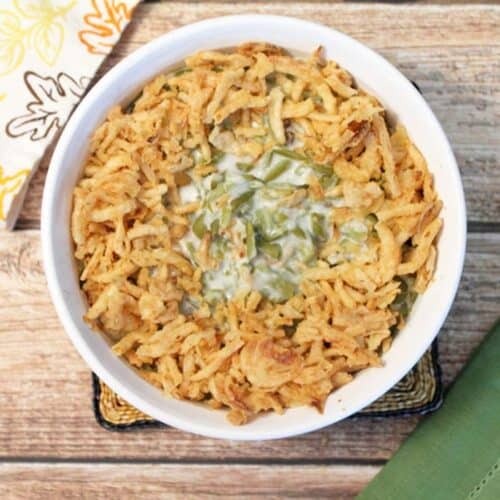 This easy and very traditional green bean casserole combines mushroom soup with loads of crunchy fried onions for a favorite Thanksgiving side. Preheat oven to 350 degrees. Prepare a 1-1/2 quart casserole dish by spraying with a nonstick spray or wipe with butter. Combine soup and milk, then add pepper, beans and 2/3 cup onions and pour into prepared casserole. Bake for 30 minutes. Stir. Top with remaining onions and bake for 5 more minutes. To make your own fried onions instead of canned, slice a large onion into thin slices and toss with rice flour. Shake off excess. Place 1/2" vegetable oil in skillet, heat over medium-high heat and, when the tip of an onion ring sizzles, place a handle full of onion slices in oil and crisp up. Repeat with all remaining onion slices then set on paper towel to drain off excess fat. Let cool and use in place of canned fried onions. To make your own mushroom soup and leave out the condensed soup and milk in the recipe above, combine 2 T. olive oil, 1 small chopped onion and 1/2 teaspoon minced garlic in a skillet and saute for 5-6 minutes. Add in 8-oz. chopped white mushrooms and a little more olive oil as needed. Cook another 3 minutes then stir in 1-3/4 cup of plain almond or coconut milk and a pinch of thyme and bring to a boil. Whisk in a thickening paste of 2 Tablespoon cornstarch and 1/4 cup almond or coconut milk. Stir continuously for 1 minute then reduce heat and let simmer for 5 minutes. Season to taste with salt and pepper. Continue to assemble and cook as stated above.